Torre of The Fearful Adventurer asked bloggers the world over what their fear was recently. What's even cooler than making a whole lot of people sit back and think about what they're really afraid of is that she turned it into a very awesome contest. Now, I'm an international blogger so I sadly don't qualify to win which makes me a little sad, BUT I wanted to participate anyway. This was all prompted by her book, Love with a Chance of Drowning which explores adventuring despite fear and in the process showing those fears whose boss. Adventure. Conquering fears. Having fearful adventures! Bloggers getting together and discussing all these wonderful things! This has me written ALL over it. I've always considered myself a pretty brave person. My mom likes to tell a story about the time I was about 3 or 4 and told some big kids at the park to get off the swings. Apparently I told them they were to big for the swings and they weren't playing and I wanted to play so really they should just move along. Obviously I don't remember this. That moment is probably the first of what I like to call "fits of bravery." I get them from time to time. 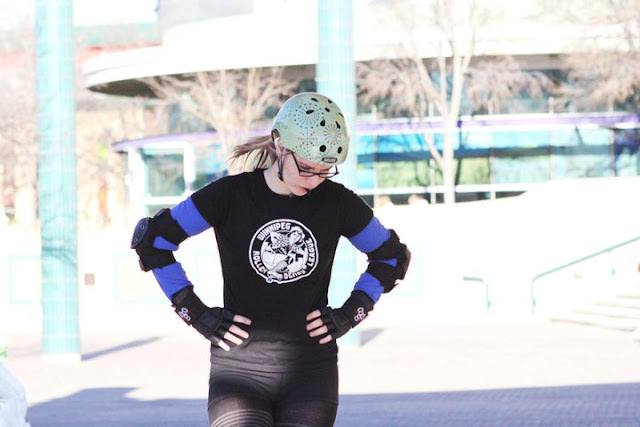 It's what caused me to start playing roller derby. It's what caused me to move to England for a summer and work. It's what caused me to apply for a press trip. The biggest fit of bravery I've ever had was probably agreeing to move overseas with John. Being a Canadian living in Switzerland and trying to pursue a writing career is basically living a fearful adventure on a daily basis. I can be pretty damn brave when I want to be. I want to let you in on a little secret though. I'm afraid of a whole hell of a lot. I have some serious fears. Like reaches into your chest al a Temple of Doom and rips out your heart fear. So So what are just some of the monsters under my bed? Losing John. As much as I rail against the notions that your husband should complete you and all that schmaltz. I would be lost without him. Very very lost. I’ve been with John 10 years, married for 7 of those. I understand in the grand scheme of relationship longevity that’s a drop in the bucket but I would hate to think what might happen to me if something were to happen to him. He travels to places that have been known to have some civil unrest in the past. He was in Kyrgyzstan for their first peaceful transfer for power ever. A week after he was in India riots broke out in the intersection he was travel through to get to and from the office he was at. Not being able to tell my paternal grandmothers story. And boy does she had a good one. My head is full of her words and I want to get them out of my head and on to paper. Even if it’s for me. The thought of her words getting lost due to my own inability to get my act together and get them out of my head is pretty terrifying. Things in the ocean. Thank jebus I live in a landlocked country! Phew, dodged a bullet there. These are all fears I can mostly get over. I will tell my grandmothers story. I will eventually convince myself that the chances of being eaten by a shark are low. If I ever lose John I know I will figure myself out. Regardless of the fact that I'm currently living a pretty fearful adventure I have another one sitting in the back of my soul waiting to happen. I want to find a place to call home. I know a lot of you just went "ba?" But please hear me out. Everyone likes to have a space, a room, a corner. A piece of somewhere to call their own that centers them. It’s more than where your stuff is. It’s more than where your history or family is. It’s a place that is yours and no matter how far away you wander it pulls at our being and reminds you of what’s behind you and helps you dream of what might be ahead. My husband has a house in a little town called Pierson. It’s in the most Southwest corner of Manitoba and only about 200 other people call it home sweet home. My best friend, though she hails from our nations capital has built a home and is raising her family (my godchildren of awesome) in the city in which we met. A perfect home with a big front window that I love seeing my godchildren waiting at when I pull up to the curb. My parents have a great little bungalow on a small piece of land on a quiet street in a quiet coastal town which they moved to 2 weeks after John and I said "I do." There seems to be s big gaping hole in my heart in the shape of a place to call home. Up until this point in my life I’ve been rather nomadic. I saw more of Canada by the time I was 12 than most people see in their lifetime. In 2011 I put only the things I couldn’t replace into storage at my in-laws farm so I could head overseas with my husband on a new adventure. In our bags were bare necessities and two beloved coffee mugs. Three bags each to restart our life in Switzerland. I use to cling to the homes of my grandparents. Those homes didn’t change even if mine did. Then those homes started disappearing. That’s only to be expected. My grandmothers couldn’t keep living in houses where they once raised their own families after my grandfathers had passed. To big, to lonely, to many memories and too much work for one aging person. I found myself trying to explain to my husband after the sale of the home my mother grew up in was final, “Imagine you could never go back to the farm. Imagine your parents sold their house, the land, everything to a complete stranger and you could never go back there. You could never turn right at the Co-Op sign again and pull into the yard.” I had a playhouse turn storage unit on my in-laws probably with an assortment of boxes but that’s not home. That’s stuff. But why is that so scary? If you're Canadian you'll remember that line in the Littlest Hobo's theme song that goes, "maybe tomorrow I'll want to settle down." We would be giving up everything to settle down. Paris for the weekend. Spur of the moment trips to Rome. A quiet apartment that would be considered a condo with a view of the Alps. John traveling to places like Madagascar and Bangladesh for work would probably stop. Having the world at our door step would become having kilometers and kilometers of the same province outside our door. Knowing us we would make it an adventure as best as we could but our lives would never go back to be the thrilling yet frightening life we lead now. We would just be left with looking back fondly and telling people, "well this one time when we were living in Europe...."
I don't know if I'll ever be ready for that. But at the same time I want to be like the people I love. I want to have a home that stops changing. I want my right turn off of highway 3 by the Co-Op sign. You will always have a home where I am, just so you know. I really like this post - it's honest, relatable and vulnerably transparent. I am also afraid of the ocean (I won't even eat sea food it wigs me out so much) and I still consider my parent's house "home" despite not living there for over 5 years now. I think making your own home is an important step in becoming a "real" adult. Good luck in your quest and I look forward to your grandmother's story. I also really love this. Amen to #1 and #3 on your list. I also live with the same fears every day.. While my husband doesn't travel anywhere (without me! ), he does build houses for a living, and the thought of a terrible accident happening on his job site haunts me daily. And, well, fish are just creepy as f*$& ! No explanation needed there! ha! I think what you and John have done in moving across the world is very admirable and adventureous and something I hope we can one day do. And one day you will have your turn off, but for now, home is where the heart is. I have the same thought, though I do not like to travel nor even step outside of my home all that much. I think it's good to have a space of your own, even just a small room. sometimes I save things just because I think I would have in the future a really great home but now I think it's best to just do everything you want and not to save anything. but that's just talk. I always fear I would do wrong. anyway, thanks for sharing your thoughts and letting me ramble about mine. visiting from the BBN. hope you have a sweet day.